First Britain, then Monaco. Now, it's Germany's turn for a royal wedding. 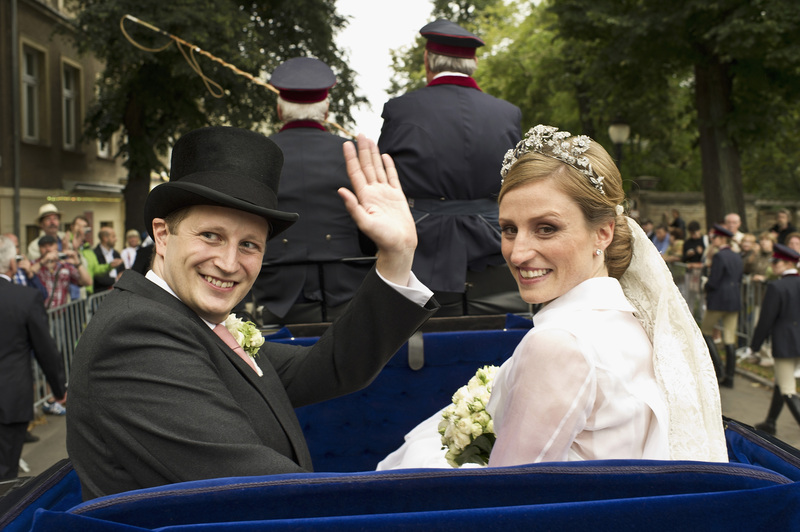 Prince Georg Friedrich of Prussia, a descendant of Kaiser Wilhelm II, married Princess Sophie Johanna Maria of Isenburg Saturday in Potsdam in a religious ceremony broadcast on national TV. The weekend ceremony, attended by almost 400 guests, was preceded Friday by a civil wedding and celebrated with a pre-wedding concert benefiting The Prussian Foundation. After exchanging vows in the Potsdam church, the couple climbed into a blue Landau carriage, drawn by six horses, for a trip through the grounds of historic Schloss Sanssouci, which, for centuries, was the summer palace of the Prussian monarchs. A reception was held in the estate's Orangerie. The bride wore a long-sleeved, tiered gown of organza and satin with a 12-foot-long train designed by Wolfgang Joop. She also wore her family's 100-year-old bridal veil, held in place by a diamond tiara, also a family heirloom, that dates back to the mid-1800s. The 35-year-old groom, who heads the Imperial House of Hohenzollern, works for a company that helps universities bring their inventions into the marketplace. He and the 33-year-old bride, who works for a non-profit company, are childhood friends.